Every builder claims to build the “best” quality home, but what does that really mean? At FLC, we take some very specific steps to ensure our homeowners get the very best quality at every stage of construction. There are literally hundreds of little things we do to make our homes better than those you’ll find just about anywhere. But here are 52 things that you’re not likely to find in homes built by other builders in Central Florida. Read through this list… then compare our features and standards with any other builder. Then compare our prices. 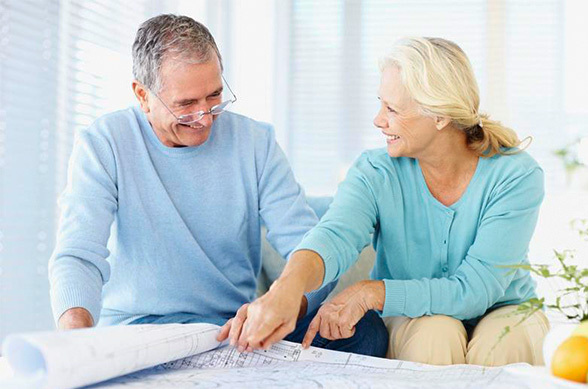 We think you’ll see why FLC sets the bar for quality and value in great retirement living. 1 Every customer meets with a design specialist and a home decorating consultant, both of whom work with you to customize your home so that it meets your needs exactly, and is built with the colors and options that you select. 2 We have one of the best design centers of any builder of 55+ homes. We have more tile choices than some tile companies, and we have more choices in cabinets, counter tops, fixtures, etc., than even much larger builders of more expensive custom homes. 3 We only charge for changes that cost money. While most builders charge a “change order fee” even for items that don’t actually cost them money (for example moving a door or window), you’ll never incur such “phantom costs” with us. 4 We keep our pricing on options and changes at a reasonable level. If you compare, you’ll usually find our option costs to be much lower than our competitors. And, unlike many builders, when you delete a standard feature, we give you a credit for it. 5 Every single home we build has its own individual set of plans. We never use “generic plans” where one set of drafted drawings is used for many homes. You’ll approve a set of plans that spells out exactly the changes and options you have selected. That way, there is much less potential for errors during construction. land surveyor. We typically set a home approximately 24” above the roadway to assure proper drainage. Our houses are typically about 8-12” higher than our competitors, resulting in more positive drainage away from the homes. 7 Each home is individually reviewed by several engineers before it is started. Mechanical and electrical engineers review every plan and provide detailed drawings that reflect the exact home we are building as it sits on each lot. This ensures among other things, a more efficient air conditioning system. Additionally, the truss company designs and has an engineer review and certify every roof system before we start the home. Finally, a separate engineer reviews the final assembled plan package to make sure we meet all local and national building codes for structural performance. 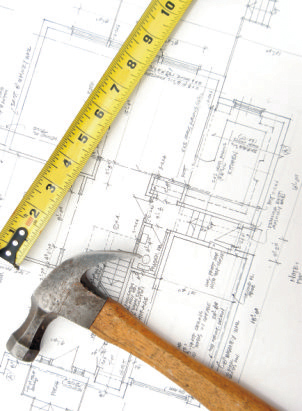 8 Our on-site supervision of your home’s construction is by licensed building contractors. Most builders use “superintendents” who are generally not licensed contractors. Trained and licensed professionals can often spot errors or problems that would be overlooked by a superintendent with less training and experience. 9 We use a monolithic foundation that is a minimum of 20” tall. This ensures we have at least 12” below the grade and 8” above the grade. Many builders use 16” tall foundations. 10 We use 3000 pound concrete for our foundations–a special blend that does not have a fly ash “filler” that comes in some cement. 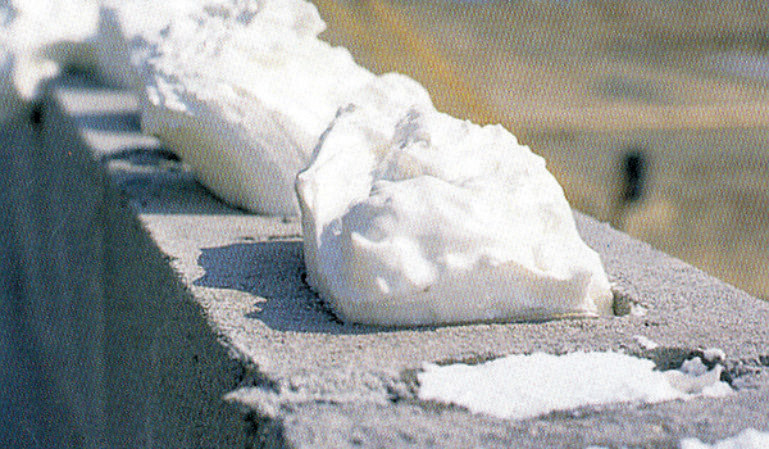 Cement that incorporates such additives produces a finished product that is not as durable or strong. The fly ash free cement used by FLC is more expensive and a little harder to work with but we think it’s worth it when setting the foundation for a top quality home. 11 We NEVER “load” the foundation with concrete block the day after we pour the slab. We always wait a minimum of 48 hours, which is the most critical curing period in a concrete slab. Many builders begin loading concrete block on the slabs with heavy forklift trucks the very next morning after pouring. Although all slabs in Florida are subject to minor settling cracks, such practices increase the likelihood, and in some cases, the severity of slab cracking. 12 We reinforce the block walls of your home using a special material called “Dura-wall,” not normally used in residential construction because of the labor and material cost involved. Dura-wall is a ladder shaped reinforcement grid that is put in the mortar joints between courses of block every three courses. This system adds a great deal of stability and additional structural integrity far beyond “minimum” code requirements. 13 We use “Super” or Type “S” mortar mix. This mix is more expensive, but it has more cement in it and results in a more structurally sound product. Type “S” cures to a higher strength much quicker than a standard mortar mix. 14 FLC requires standards for our roof trusses that are substantially above minimum building code requirements. (As you might guess, many builders follow the minimum code requirements to minimize costs.) FLC specifies that the top and bottom chords of all trusses are all #1 grade material. Truss companies typically use the #1 only on the top chords. This can lead to problems down the road with lumber warping after your house is completed. We end up with straighter ceilings and flatter roof planes because we require all chord lumber to be #1 grade yellow pine. 15 We also require that gable framing be at 16” on center instead of settling for 24” on center as the code requires. Straighter, flatter gables enhance the aesthetic appearance of your home. 16 We design every one of our truss systems to incorporate the attic storage area over part of the garage. This isn’t an afterthought, it’s an integral part of the construction process. 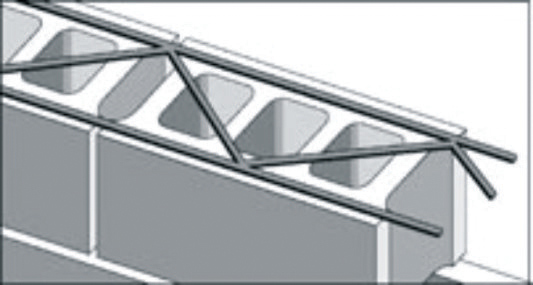 17 FLC has developed special bracing techniques that give our homes stronger gables for better resistance to gale force winds. Our methods are far less prone to errors in the field, which could compromise the strength of the roof structure. 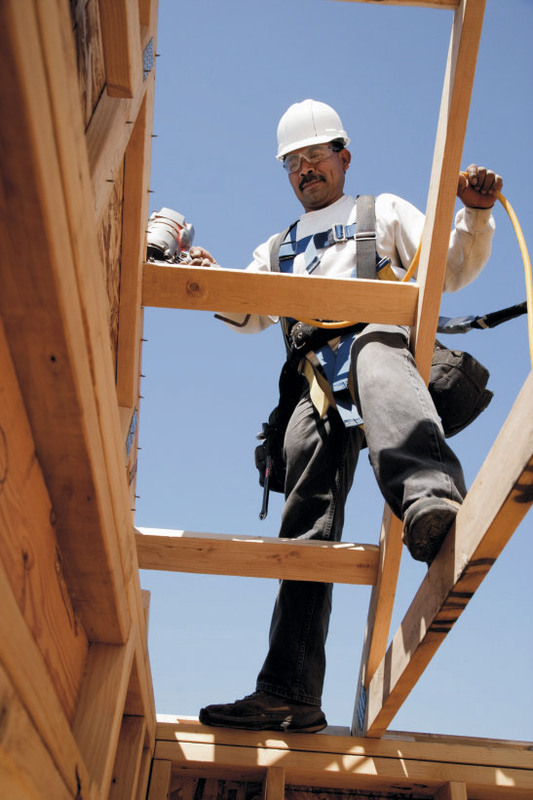 18 We specify that a nail goes in every fastener hole in our roof systems. If there are 12 nail holes, they get 12 nails. Eight nails might meet code and be “enough” for most builders, but we don’t want to compromise on quality for this important component of your home. 19 We install radiant barrier sheathing on the underside of the roof in every home for increased energy efficiency. 20 We use a synthetic roofing underlayment with a 20-year warranty. 30 pound roof felt is code, but the extra thickness offers more protection, both during construction and after the home is completed. 21 FLC homes typically have more roof vents than those of other builders. The better your attic is ventilated, the more energy efficient your home is. Plus our roof vents incorporate baffles to help minimize rain intrusion. 22 We use steel studs for interior framing of the walls of your new FLC home. This means straighter walls, not only when you move in, but more important, months later because wood framing is more subject to warping as it slowly dries out. 23 Even though we use steel studs for framing, we use wood bracing inside the walls at all doorways, and at all nailing locations for cabinets and trim. This means, doors are hung better and will operate more predictably for years to come. It also means that cabinets, baseboard and trim are less likely to settle and crack over time. 24 We build a very “green” home. With such standard features as Tailored Foam block wall insulation, R-38 ceiling insulation, low flow plumbing faucets and low flow toilets. This document was updated on June 15, 2017 and may not reflect the specifications or building standards of homes purchased prior to this date. 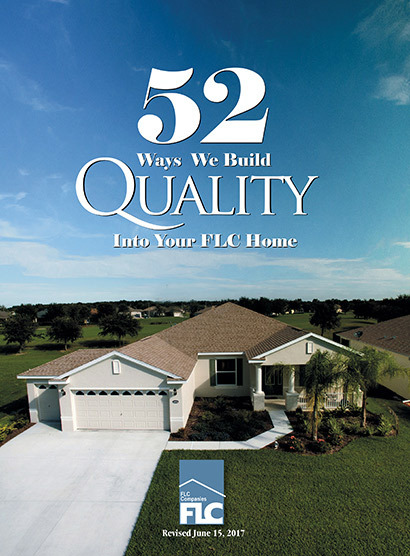 Due to continuous product improvement, specifications, prices, specifications, and other aspects of FLC homes are subject to change at any time without notice.